On September 26, 2017, the biggest recruiting scandal in college basketball history sent shock waves through the world of sports. Caught up in a massive FBI and NCAA investigation--and the intense media spotlight--was Rick Pitino, the Louisville Cardinals' Hall of Fame coach. Here, from Pitino himself, comes the real story of the ongoing case and the hard truth about how college hoops has been pushed to the brink of disaster by greed, bad actors, and shoe company money. Rick Pitino has spent a lifetime in basketball. He is the recruiting and coaching maestro behind Final Four appearances with three different teams, and National Championships at two of them. He worked the early days of the legendary Five-Star camp and scouted players without the influence of agents, runners, or shoe companies. And he has run today's recruiting gauntlet of sports apparel marketing, corrupted assistant coaches, unethical youth coaches, and powerful organizations hellbent against him. Rick Pitino has seen it all, dealt with it all, and now tells it all while offering his take on what needs to be done to save the game he loves. 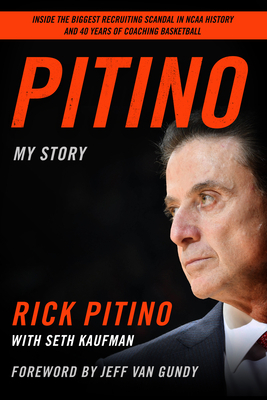 Pitino is the story of an epic coaching career and the evolution of NCAA basketball to the multi-billion-dollar enterprise it is today. It is also a master's course on the arts of coaching and recruiting. And in the telling, the one and only Rick Pitino lays all his cards on the table in addressing scandals of his past and the current headline-grabbing investigation that led a packed Board of Directors at Louisville to derail his career.